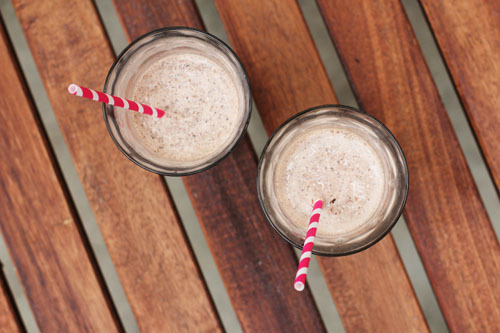 Double Chocolate Milkshake…Move Over, Starbucks. The whole reason I was inspired to make homemade cocoa syrup last week was because of my little Anna. Anna is obsessed with the Double Chocolaty Chip Frappuccino® Blended CrÃ¨me at Starbucks. Every single time she sees a Starbucks, which in America is about 21 times per day, she asks for one. Needless to say her life is full of disappointment. Last week she was begging for one and I promised we would go home and try to make it. Which is why I ended up making chocolate syrup, which ended up taking all my energy and we never got around to making the drink! Today Anna and I finally got down to business. We nailed it. Totally as good as Starbucks. The syrup that Starbucks uses is mocha, so the taste is a tad different, but it’s a very small difference. Anna is in heaven and wants me to make more. I don’t think I’ve eliminated the begging from my life, in fact it may increase! But at least the occasional indulgence won’t cost me 4 bucks a cup. 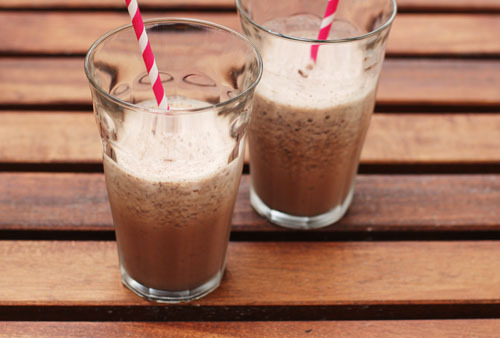 Double Chocolate Milkshake...Move Over, Starbucks. I make this at home all the time for my oldest and even I have it sometimes. Nice work! Sounds like a fun drink. Jane, these sound dangerous not only to my waistline but to my intense chocolate shake addiction!! Costco now sells Ruby’s chocolate shake mix so we’ve been making that lately. This sounds AMAZING and I’m planning to make your cocoa syrup as soon as we run out! Where do you find the high quality cocoa powder? I always get my cocoa powder at fancy grocery stores…whole foods could potentially have it. in the bay area I got it at draeger’s and adronico’s. hope that’s helpful! might have to check out that ruby’s mix! I miss Andronicos. Their sandwiches were SO good. We always got our cheeee and wine there too. Brilliant idea and everything always tastes better when you make it yourself! Thank you so much for sharing, adding this to my list of what to make this weekend. looks delicious, this is something my son would LOVE me to make for him… immediately! my daughters will love this!! I had never had a Double Chocolately Chip Frappuccino before I read your blog entry. I was intrigued. I know the whole point was to inspire me to make one…..but somehow, it backfired. I do not have a super-duper blender that chops ice well. But, I do have a Starbucks 5 minutes away….and I work from home……..so I decided to get away from my desk and I went to Starbucks and bought my 1st Double Chocolately Chip Frappuccino. Now, like Anna, I’m obsessed! I want one several X a week. I’m shutting done my laptop now for a quick DCC Frapp run.